One important thing in this world is the language , because with language we can communicate with other people in another country. Although we can use body language but I think it is less understandable for the layman like us because sometimes the real meaning of the body language would sometimes differ from what is in the intent. For those reasons, we should be able to use more than one language, besides can make money with the language could also create a relationship with other countries of different languages ​​. 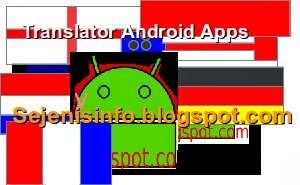 With language we can understand each other with what is delivered from the others, although there are so many languages ​​in the world but with a bit of learning the language constraints could be completed, with android application, it will be a little help with what is delivered by the different other languages​​. Although the language will be easy in conversation but also the language that we tell from the mouth must be in accordance with the spoken word, or at least polite, with language sometimes can happen something wrong so we must use the good language so peace will always be created. Language can reflect a person's good or bad, People can sometimes reflected kind of a good speech. Are you are a spoken word that is always keeping every speech is not good if so you are a good person i think. There are so many android apps that are so important to our life, whether it's an application for health, education application and another android applications that are important. whatever you use language, but if you can use more than one language sometimes it can make us more confident and more reliable by others who need translators for example. 1 . Google Translate, using google translate then you will be easy to find a variety of languages ​​we can translate more than 70 languages ​​in them so you don't need to install many other applications simply by google translate the translator app that installed it is enough. In addition to being a translator tool with google translate in android we can also listen to audio so we could follow a etiquette that will speak the language we learn. Can be used offline so no need to connect to the Internet . Afrikaans , Albanian , Arabic , Armenian , Azerbaijani , Basque , Belarusian , Bengali , Bosnian , Bulgarian , Catalan , Cebuano , Chinese ( Simplified ) , Chinese ( Traditional ) , Croatian , Czech, Danish , Dutch , English , Esperanto , Estonian , Filipino , Finnish , French , Galician , Georgian , German , Greek , Gujarati , Haitian Creole , Hebrew , Hindi , Hmong , Hungarian , Icelandic , Indonesian , Irish , Italian , Japanese , Javanese , Kannada , Khmer , Korean , Lao , Latin , Latvian , Lithuanian , Macedonian , Malay , Maltese , Marathi , Norwegian , Persian , Polish , Portuguese , Romanian , Russian , Serbian , Slovak , Slovenian , Spanish , Swahili , Swedish , Tamil , Telugu , Thai , Turkish , Ukrainian , Urdu , Vietnamese , Welsh , Yiddish . 2 . Dictionary + Translator , translator with various languages ​​for the android that has many advantages such as we can use the mode to translate sentences long sentence so we do not have to bother to translate one by one into various languages​​. Within the app there are many features that we can use them there are modules for learning, pronunciation and more. Czech, English , Russian , German , Spanish , Slant , French , Romanian , Serbian , Slovak , Swedish , Tagalog Thai , Turkish , Ukrainian , Vietnamese , Yiddish , Greek , Portuguese , Korean , Latin - English , Latvian , Lithuanian , Persian , Polish , Croatian , Dutch , Estonian , Finnish , Hebrew , Hungarian , Indonesian , Japanese , Russian , Azeri , Spanish , German , Hungarian , Italian , Polish , Albanian , Arabic - English , Bosnian , Bulgarian , China and more . We can choose from two translators from various languages ​​applications to other languages ​​such as English - Indonesian , Indonesian - English , Dutch - English and vice versa , French to English and vice verse almost all languages ​​could be translated by both translator for android application. Although sometimes using the translate tool each sentences sometimes would be wrong so at least you know some important feature of the language in question. Can we imagine if the world has never been used in any language! might be a bit funny, because we will convey every possible using the language codes or hands to be delivered and the world will feel quiet. At Borodino…Napoleon could muster no more than 135,000 troops, and he lost at least 30,000 of them to gain a narrow and Pyrrhic victory almost 1000 km deep in hostile territory. The sequels were his uncontested and self-defeating occupation of Moscow and his humiliating Human translation retreat, which began on 19 October, before the first severe frosts later that month and the first snow on 5 November. The more relevant search phrases, the simpler your app is going to be to find. Go here for more interesting information on Contact - Anthony Teixeira - Professional French Translator.